I considered adding this postcard to the list of Papergreat's "water-stained works of art" series. But I'm not entirely sure what this stain is. Water? Rust? Mold? Alien fungus from the planet Santraginus V? I don't have a big enough budget in the Science-Research Division to investigate this thoroughly. But, as I've said in the past, I still think this is a thing of beauty. The passage of time and the brownish stain have given this still-colorful (and butterfly-filled) postcard more character than it might otherwise have if it was in "mint" condition. The card was postmarked in Woodbine, York County, Pennsylvania. (Apparently, this unincorporated community once had its own post office!) The date is December 24, sometime in the 1920s — the final number in the year is too blurry to read. The second part of the note wasn't easy to decipher, but it doesn't seem to be of much consequence — like most text messages of today, I reckon. 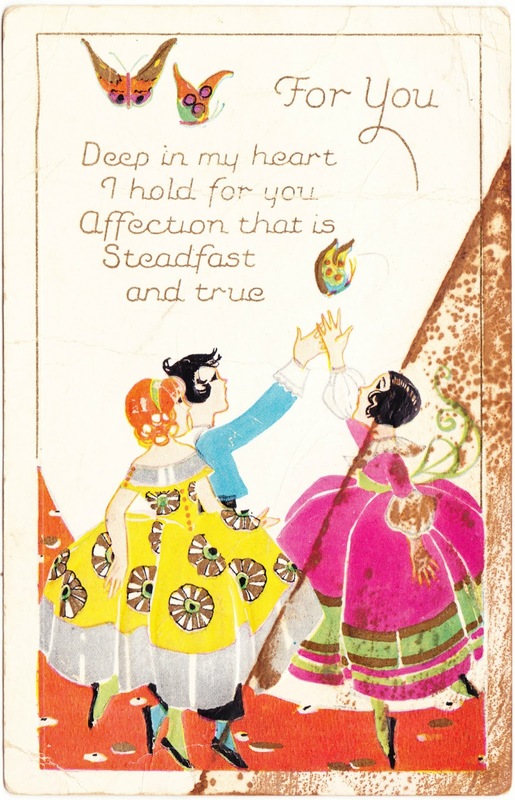 But, unlike today's texts, we still have this lovely postcard to accompany a nearly-century-old piece of everyday communication. "The Toboggan Girl" and a message from a "P.C. Friend"